One of the many things that a new parent prepares for, before the arrival of their bouncing baby, is selecting a pediatrician–a doctor who specializes in the physical, behavioral, and mental health of a growing child. They are particularly knowledgeable in the symptoms and treatment of childhood diseases. Just as a parent brings their child to an expert pediatrician, an adult child should bring their aging parent to an expert geriatrician. Geriatricians focus on senior health, disabilities, and diseases related to old age. Your aging loved one can greatly benefit from the experts in geriatric medicine. As adults, most of us seek the care of a general practitioner. A general practitioner is a doctor who treats a wide range of medical problems for all ages. But a geriatrician specializes in the care of older adults. 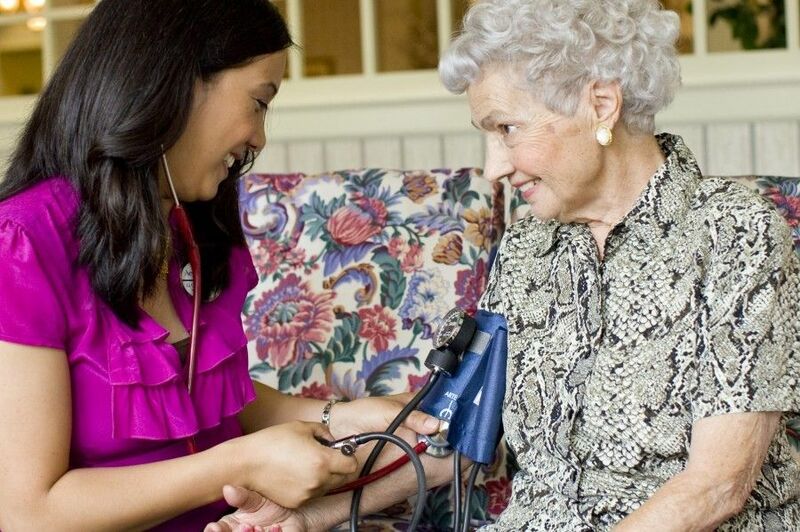 They are trained in family practice or internal medicine but have additional training in the care of older patients. They are understand the impact of a disability on independence and are experts in illnesses associated with age. They can address health concerns, such as the struggle with frailty, incontinence, frequent falls, memory loss, and the side effects of medication. Geriatric practitioners can distinguish between disease and the effects of normal aging. Older patients present symptoms differently. They absorb medications more slowly and often respond differently to normal protocols. Multiple chronic conditions can overlap in older individuals. Geriatricians are trained to identify and manage these differences. Multiple problems can quickly compound in an older patient. A mild fever can lead to confusion, resulting in a fall with a now broken hip. Older patients taking multiple prescribed prescriptions and over-the-counter medications can be at risk for potential drug interactions. Specific attentions needs to be paid to the many drugs treating various illnesses and conditions. Presentation of diseases may be vague or difficult to determine in cognitively impaired patients who may not be able to explain their symptoms or express pain. Geriatricians are trained to find the root cause despite these limitations. Frail elderly individuals may decline some types of medical care because the risk-benefit is different in the elderly. The risk of post-surgical complications may mean not having an elective surgery but still making the patient comfortable by easing pain or annoying symptoms. Many patients have a lengthy medical history, so understanding past illnesses and current conditions is necessary when creating a comprehensive care plan. Elderly patients can have various organ systems that decline, such as vision, hearing loss, taste and smell. Geriatricians can provide elder care options such as home services, skilled nursing facilities, assisted living, and hospice if needed. Geriatricians collaborate with other medical disciplines such as nurses, pharmacists, therapists and social workers to treat all aspects of a patient’s life. The biggest difference between a general practitioner and a geriatrician is their philosophy and approach to handling an elderly patients. Geriatricians practice a “whole person” approach. They consider the psychological, social, and spiritual dimensions of an individual, along with the functional, physical and environmental assessment. Independence, function, and quality of life are a great concern to an older patient and of equal concern for their geriatric physician. At Aegis Living, we understand the impact that specialized care can have on a resident. We have partnered with the University of California San Francisco to provide primary and palliative care to our residents through regularly scheduled appointments within our communities. The benefits and convenience of utilizing an in-house medical care provider allows our residents to receive compassionate medical care within the comfort of their apartment.